I read this interesting post recently about why Crossfitters don’t really care what people think about the sport, and some of the comments are rather heated. If you Crossfit, you will get what Lisbeth Darish is saying. If you don’t Crossfit, you may end up leaving angry comments on her blog. Non-fitters tend to think that Crossfit is just another exercise program. And if they think that way (as Darish points out), it doesn’t really matter to us. Honestly, it’s better to let some people go work their biceps. 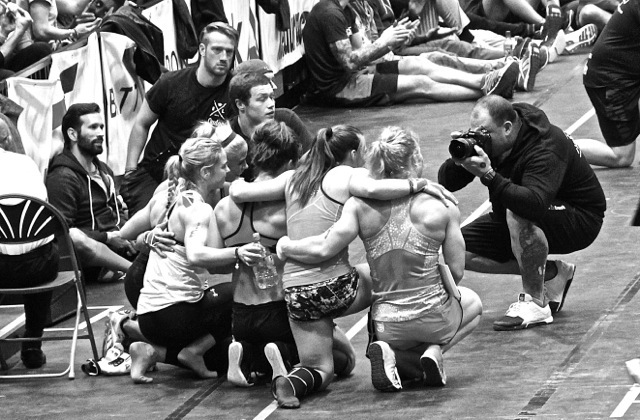 Crossfit is a large, crazy, diverse family. But as in any functional family, there goes with it a healthy sense of pride. In this kind of family, kids ALWAYS think their family is the best. Parents ALWAYS love their children (even if they have to use some discipline from time to time). Grandparents ALWAYS adore the new arrivals. Sure, there might be some sibling rivalry and a cousin you think is weird, but it is STILL family. When you see the faces of your brothers or sisters through the window of a coffee shop, and they turn to wave you in, you automatically have that sense of belonging that fills your soul. Better yet is meeting a second cousin from a place thousands of miles away. Neither of you have a language in common–you don’t even know each other’s names, and yet, it doesn’t matter–you still have that bond. Crossfit (at least, as far as I’ve seen) transcends race, gender, socioeconomics, sexual orientation, nationalities, languages, religions, shoe types, hair colors, tattoos, star bellies…the list could go on. It’s not that we don’t care about the point critics are trying to make, it’s just that my grandma can push-press their grandma, and that makes ours better. We know what our family can do. I have some friends and family members who (*gasp) do not Crossfit. But they see what it’s done for me, and therefore, they love it too. They are like the best friends who stay at your house every weekend. They love your family and so you unofficially adopt them. But whether you’re a best friend of Crossfit or a member of the group, you will understand that the criticisms don’t matter: we have the coolest, best, most awesome family in the world. And nothing anyone says can change that.